JUSTIN ACLIN: November is Hero House month! On November 25th, my first graphic novel hits comic shops. As such, I am officially declaring November Hero House month, by the power vested in me by ownership of this domain name. November's such a big month, in fact, that I went ahead and took the entire month of October off from blogging. You know, just to save up energy. In all seriousness, though, on behalf of myself, Mike, Frank, Brian and Shawn, we couldn't be more excited that our nearly six-year journey is finally nearing an end. I'm going to try to post as much as possible this month leading up to the book's release, both to tell you when we've got promotional stuff going on (check back Monday for a link to a new podcast interview! ), and to try to finish up the behind the scenes stuff. Which brings us to today's post! See that sketch at the top of the page? That was Mike's ninth and final take on the team jacket (you can see the final colored take on Ed's cover, as well as in various places throughout the book). 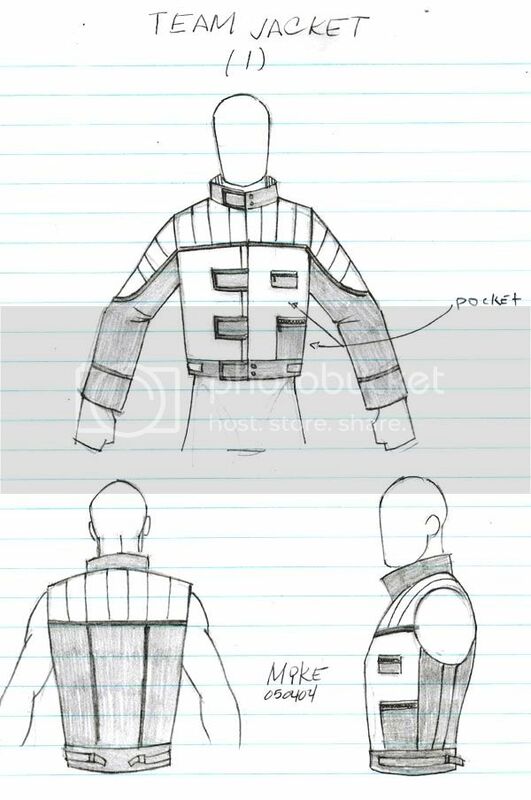 My original direction to Mike was that I wanted the jackets to make the Eps look like superheroes when they needed to, but to look casual enough that they could leave them unzipped and wear them day to day. Plus, I wanted a team insignia that was based on the Greek letter Epsilon and Psi. Not too tall an order, right? Mike's first take (above) used E and P instead of the Greek letters Epsilon and Psi. Version 2 used the Greek letters, but it was a little too bulky, a little too ski jacket and not enough motorcycle jacket, in retrospect. 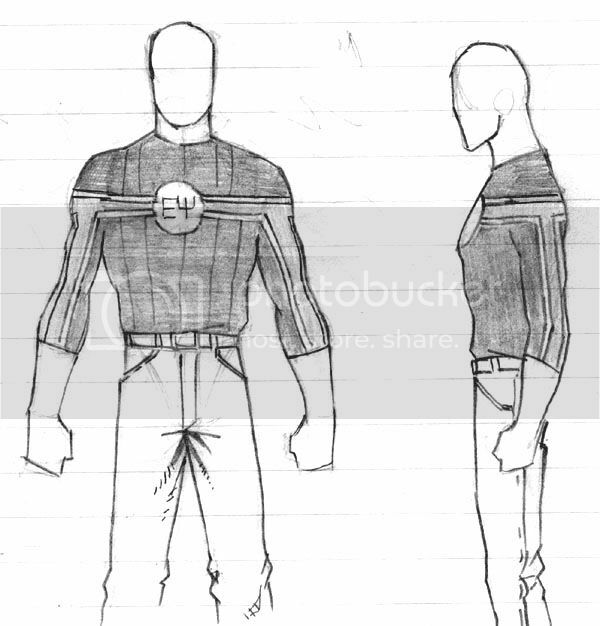 This is a rough design for a more form-fitting shirt that Nate was going to wear, the thought being that the speedster wouldn't wear a bulky jacket. You can see the final design we settled on in the cover, but Nate never actually ended up using it in the book. 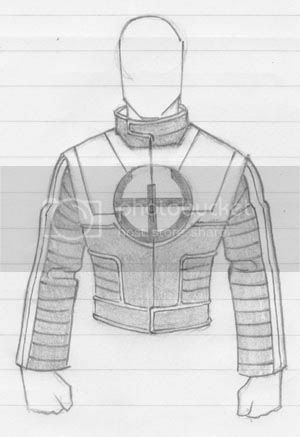 Now we're getting closer to the final design. I think it was probably this point where I looked at the shapes of the Epsilon and the Psi and said, "what if we turned it on its side and kind of stuck the Psi in the middle of the Epsilon...?" ...Which is exactly what he did here, the final version before the final version. 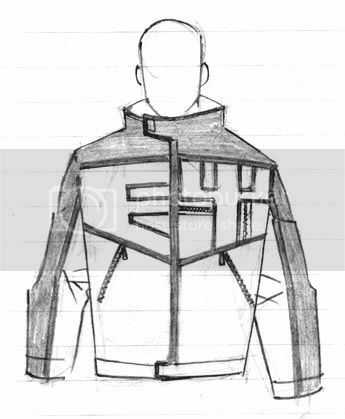 You can see that between this one and the final jacket we kind of merged the top and bottom layers of the shape, but it's all basically here. It was a tall order, but when you see the guys in the book wearing it over regular clothes with it unzipped, it totally passes for a regular jacket. And when it's zipped up, they look like badass superheroes ready for business. So check back Monday for the latest interview link, and I'll have at least one more concept art round-up before the book launches. See you then! "In all seriousness, though, on behalf of myself, Mike, Frank, Brian and Sean, "
I think you meant SHAWN. 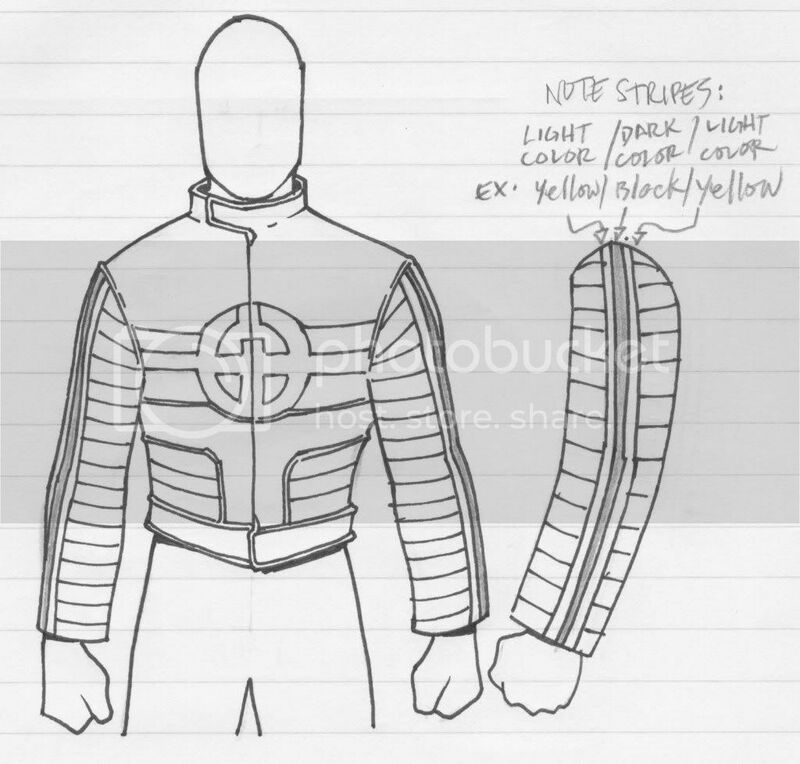 And when will these jackets be available for purchase? That's is just amazing. I love it. Very interesting post. By the way, if you own a business and need to keep your documents stored online, ideals VDR is the solution.